Despite the historically close relationship between the U.S. and Canada -- and the fact that the countries swap $2 billion in business daily across the almost 4,000-mile (6,400-kilometer) border that stretches along the 49th parallel to Maine -- a Canadian prime minister hasn't come to the U.S. for an official visit since 1997. 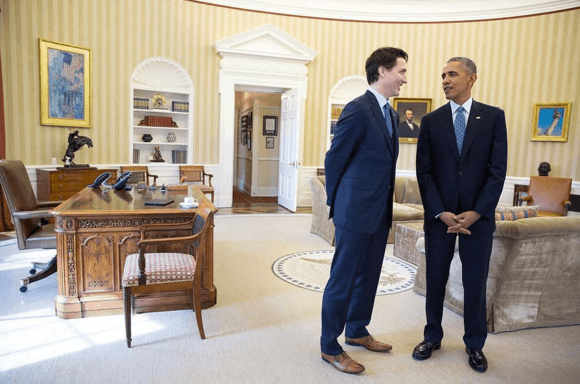 But yesterday, Prime Minister Justin Trudeau and President Barack Obama met in Washington, D.C. to discuss a bevy of issues, including their announcement that both countries will increase cooperation on tackling risks associated with climate change. In a joint statement made between the two countries, both leaders pledged to work closely together on climate change, clean energy and stewardship of the Arctic region. They also reiterated their support for the Paris climate agreement and said they would implement their respective countries’ Intended Nationally Determined Contributions (INDCs), the reduction in greenhouse gas emissions promised by countries that participated in the December climate talks in Paris. Considering that Canada and the U.S. rank in the top 10 of the world’s highest consumption of energy per capita, all eyes are on these countries in gauging whether the commitments made in Paris will have teeth. Of the many promises made by the two leaders at the White House on Thursday, one of the most significant is the drive to slash long-term methane gas reductions on both sides of the border. President Obama and the prime minister agreed to reduce methane emissions from the oil and gas sector at least 40 percent from 2012 levels by 2025. In a move that will surely infuriate the energy industry even further, the president has directed the Environmental Protection Agency (EPA) to write new regulations for methane emissions that are released from existing oil and gas sources. The EPA’s counterpart up north, Environment and Climate Change Canada, says it will do the same for existing and new oil and gas sources and will issue the first phase of proposed regulations by early next year. New regulations in Alberta will have a huge impact on its oil sands, which contribute largely to Canada’s greenhouse gas emissions — though more restrictions will be vehemently opposed by the country’s energy industry. One of the U.S. Senate’s foremost leaders on environmental stewardship and climate change has hailed the agreement. In an emailed statement to TriplePundit, Sen. Barbara Boxer of California said: "I am very pleased with today’s announcement that the U.S. and Canada are working together to fight dangerous climate change. The joint commitment to reduce methane emissions -- which is a potent source of climate pollution -- will help protect children and future generations from the worst impacts of climate change." One constituency that will experience more risk from climate change and energy exploration is the countries’ indigenous communities. Just last week, PM Trudeau met with First Nations, Inuit and Métis Nations leaders in British Columbia to discuss how the Canadian federal government can work with them to promote “clean growth” and find ways to fight climate change. To that end, both the prime minister and President Obama announced that they would develop a plan that would deploy “innovative” renewable power and energy-efficiency alternatives that would reduce many of these communities’ dependence on expensive, and polluting, diesel fuel. In addition to the ongoing environmental challenges in the Arctic, discussions including land-claims agreements as well as solutions to address social challenges will continue at the White House’s hosting of an Arctic Science Ministerial this fall. In a continued swipe at Republicans (and Canada’s conservative party, which suffered huge losses last October as PM Trudeau and the liberals were swept into power), the countries’ joint statement also said they would work on future Arctic energy deployment by taking a “science-based approach” to oil and gas. Both leaders also called for an international agreement to ensure that unregulated fisheries in the central Arctic Ocean will not be opened. And in a nod to the realities that climate change imposes on this region, Canada and the U.S. said they will collaborate to establish shipping route policies in the Arctic that will minimize any impacts on important cultural and ecological areas. While Canada has a majority government, political polarization in Washington, D.C., puts the U.S. commitment to cross-border climate change cooperation in doubt. Some Republicans are already furious about the Obama administration’s pledge to be the largest contributor to a climate finance fund for developing countries, and any executive order will likely produce unified howls from a party currently shattered by the nomination race dominated by Donald Trump and Ted Cruz. But for two countries that have long shared cultural and economic ties, Thursday’s White House summit takes their relationship further into the 21st century.